Voyager 1 is a spacecraft used by NASA to explore Jupiter and Saturn. It is identical in form to its sister ship, Voyager 2. 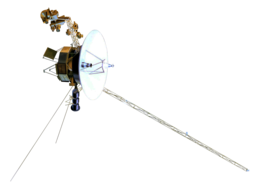 Voyager 1 was launched on September 5, 1977, to study the outer planets of the Solar System. It is now in an extended mission. Its encounter with Saturn and Titan sent it on a hyperbolic trajectory out of the solar system, traveling at 17 kilometers per second (around 61,200 kilometers per hour) which is much faster than escape velocity. Voyager 1's research team announced on 25 August 2012 that it had left the solar system. It passed out of the heliosphere and into interstellar space. Both Voyager 1 and Voyager 2 include the Voyager Golden Record, which is a recording of sounds and images of life on earth. ↑ "Voyager 1". NSSDC Master Catalog. NASA/NSSDC. Retrieved August 21, 2013. ↑ "Voyager 1". N2YO. Retrieved August 21, 2013.